This week's feature is on Kid Koala, Canadian DJ and turntablist extraordinaire. 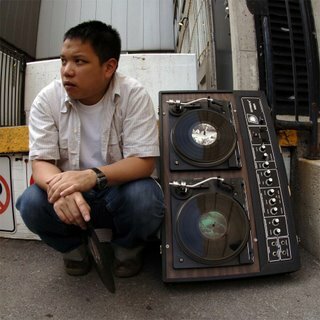 Check out episode 107, which features a track off of Kid Koala's 2003 album, "Some Of My Best Friends Are DJs," along with a dozen other sound collages by the usual suspects (and of course, a few new ones as well). I'll be DJing the final Relay at Rosalux, at Rosalux Gallery this week (Friday, August 18th) and then an event at Density Studios on the 26th (stay tuned for more info). I won't say that these are my last ever DJ gigs, but I'll allow that I intend to narrow my focus on some neglected projects for a little while, and aside from the radio show, won't be worrying about much else for some time. So, what? So, come on down and say hi! It will be your last chance for at least a little while, and both events are sure to be worth the trip. More details at the end of this post, so read on! Kid Koala is a classically trained pianist who started scratching records at a young age, on turntables he purchased with money from his paper route. He became the first North American Ninja Tune artist, in 1995, thanks to his mix tape "Scratchcratchratchatch" being in the right cassette deck at the right time. He's toured with Ninja Tune artists such as Coldcut and DJ Food and opened for touring acts such as The Beastie Boys and Radiohead. In 2003, Kid Koala became a published author - his first book, "Nufonia must fall," is a graphic novel about a robot in love with a workaholic! He's got several records out on Ninja Tune and a long list of remixes, compilation appearances and whatnot, so be sure to check out his website. *Are there any additional names used to describe this project: Your mom's favorite DJ. *Tape manipulations, digital deconstructions or turntable creations: I make records out of records. I cut up bits of audio on 2 turntables and layer them into tracks on a 24 track reel to reel tape machine. I try to make all kinds of silly and beautiful things happen with sounds. *Philosophy: Try to have some fun at some point. *How would you like to be remembered: Just some guy. Thanks to Kid Koala for being our focus this week - be sure to check out his website, and check out this week's podcast (episode 107) for 13 sound collages, including a track by Kid Koala. Well, the final installment of Relay at Rosalux is coming up pretty fast. Rosalux Gallery is located at 1011 Washington Ave. South, in Minneapolis. Featured DJ's include Tarik Moody and DJ Don Cuco of The Current's "Rhythm Lab," Jennifer Downham of KFAI's "Groove Garden" and myself. There's free parking to the left of the Open Book Complex, which is the building where Rosalux is located, on Washington Avenue. The final Relay at Rosalux is this Friday, August 18, from 9-midnight (or later).